Beth Massey on her 1963 VBB. Photo: Emma Byrnes. I recently started writing stories for RACV’s RoyalAuto magazine. Here’s the first – a look at the passionate people who love their scooters, published in the April issue, with beautiful pics by my talented wife, Emma Byrnes. See the story on the RACV website here or simply read on, below. 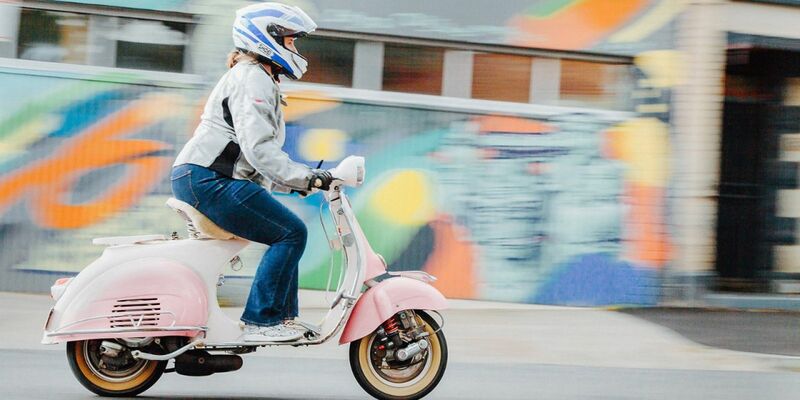 From Collingwood to Gippsland, butchers, baristas and barristers are embracing the two-wheeled freedom of the scooter commute. Written by Peter Barrett. Photos by Emma Byrnes. It’s 8.30am on a bright autumn morning in Collingwood. Underneath a grungy railway bridge by a cafe, a line of 30 scooters – Italian Piaggio Vespas, to be precise – is taking shape. Arriving in ones and twos their owners, a motley band including butchers, admin officers, nurses, baristas and barristers, exchange friendly greetings and order breakfast. Then it’s time. Time to talk scooters. There’s “Bertie”, a 1951 thin-handle-barred beauty owned by Ed Kiernan, a 55-year-old airline pilot from Kew. IT start-up customer success manager Beth Massey, 39, has brought her cute, 1963 VBB that she painted herself in eye-catching pink and white. And Luke, a 37-year-old civil construction engineer who prefers to keep his surname to himself, has turned up with his new pride and joy: a battered-looking former munitions factory bike built in 1964 and unrideable until he lovingly restored it, just a few months ago. Like most here, Luke has been bitten by the Vespa Bug. “I bought one and then I bought another one and now I want to buy one like that [pointing to a nearby bike]. What am I doing? !” he says, half pleading. Despite what this may sound like, this is not Scooters Anonymous. Instead, it’s a monthly get-together organised by the Vespa Club of Melbourne, a 540-strong group of riders, restorers and enthusiasts. Club president Julie Pond owns eight of the bikes with her husband Greg, who is club secretary. 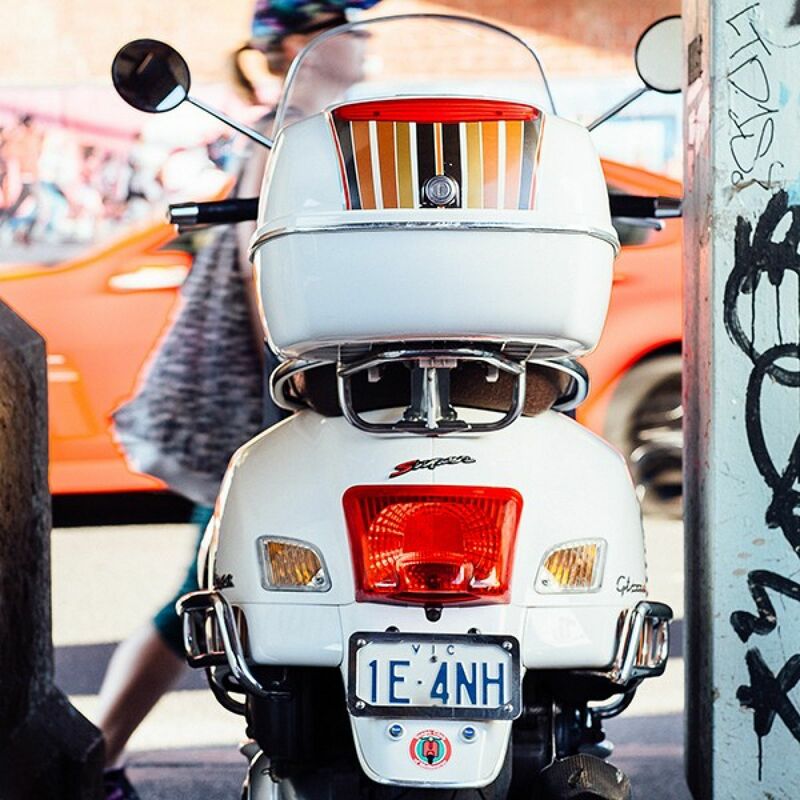 It’s unclear exactly how many scooters – Vespa or otherwise – currently travel on Victorian roads, due to issues with recording and reporting practices. According to Helen Lindner, Director Registration and Licensing Practice, Standards and Solutions at VicRoads, the number registered here has more than doubled over the past decade to 1571. But industry insiders say the figure is somewhere between 5000 and 15,000. Patrick Scarpaci, owner of Scooterama Australia, which sells brands such as Honda, Kymco and Fonzarelli electric scooters, says riders working for delivery apps such as Deliveroo and Uber Eats are fuelling a recent spike in entry-level, $3000 scooters. “Typically for us, winter is a quiet time. However, winter last year was probably one of our busiest periods,” he says. “We realised the trend was that the poorer the weather the more people order [food] online.” As a result, his sales and service numbers jumped by 25 per cent. In Carrum Downs, Hollie Black’s family business Select Scootas has been importing SYM scooters from Taiwan since 1999. She says the 2008 global financial crisis shrank the market to a quarter of its size but it’s picked up in the past 18 months, helped by increased road congestion, the ongoing ability for Victorian riders to park on city footpaths and relatively new laws that allow riders to filter through traffic at low speeds. “[The mood] is optimistic again,” says Hollie. “It’s a nice feeling at the moment to feel some growth again – especially for a family business.” On what she sees as a downside, however, Victorians are required to sit a motorcycle licence test, while in some other states an existing driver’s licence is all that is required. The scooter story begins at the end of World War II, in Italy. With his main factory bombed, owner Enrico Piaggio decided to switch from planes to affordable motor vehicles to get the country moving again. Aeronautical engineer Corradino D’Ascanio got to work, creating an easy-to-drive machine with a handy step-through frame design that, unlike motorcycles, kept its fashion-conscious riders clean. 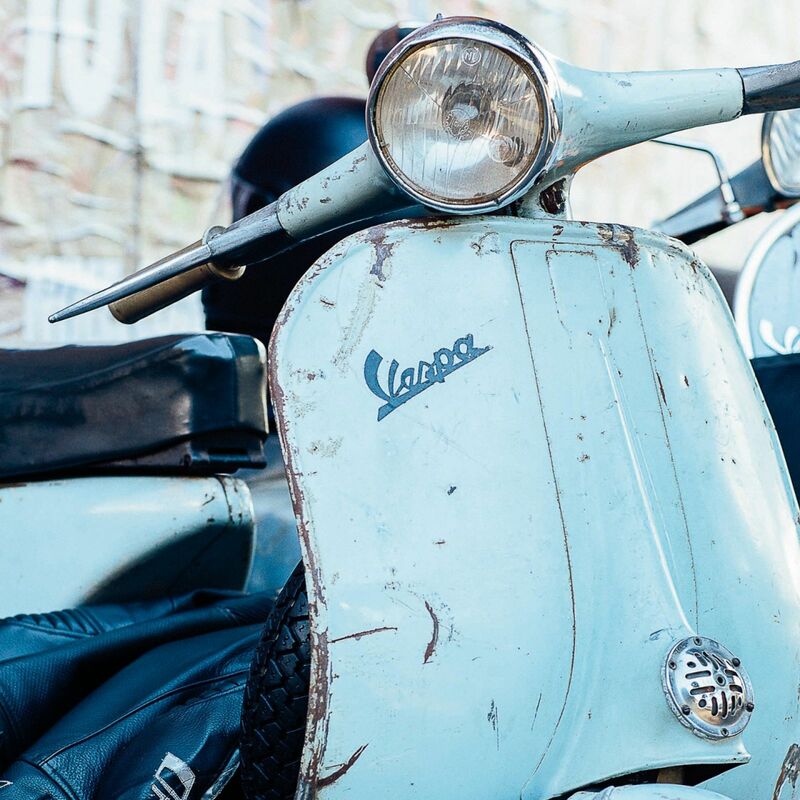 In 1946 the first Vespa, so-called for its wasp-like shape when viewed from the rear, was born. A little over a decade later in Britain, baby boomers were reaching young adulthood and two factions began to emerge: Mods and Rockers. While Rockers wore jeans, boots, leather jackets and favoured motorcycles, Mods (short for modernists) had their eye on the future. “The original British Mods were drawn to the sophistication of Europeans and their consumer goods,” says Christine Feldman-Barrett, lecturer in cultural sociology at Griffith University and author of We Are The Mods: A Transnational History of Youth Subculture. Popular culture was doing its bit to immortalise scooter culture, too, with films such as Roman Holiday and British band The Who’s epic rock opera, Quadrophenia. 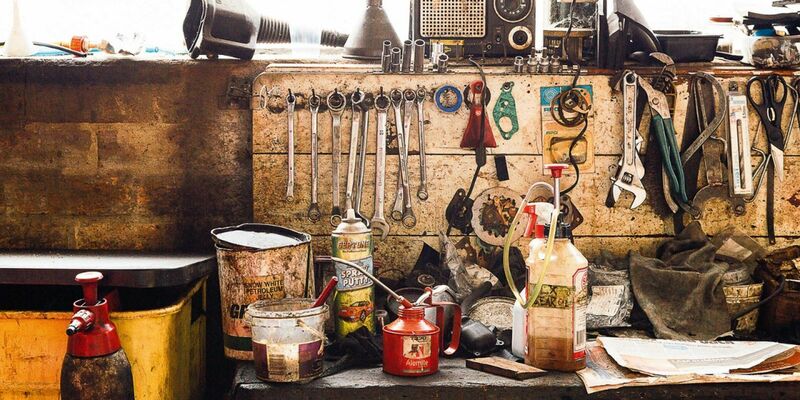 Meanwhile, in Australia, recent Italian migrant Vittorio Tonon was working as a mechanic for Malvern Star owner Bruce Small, who imported the first Vespas into the country in the early 1950s. 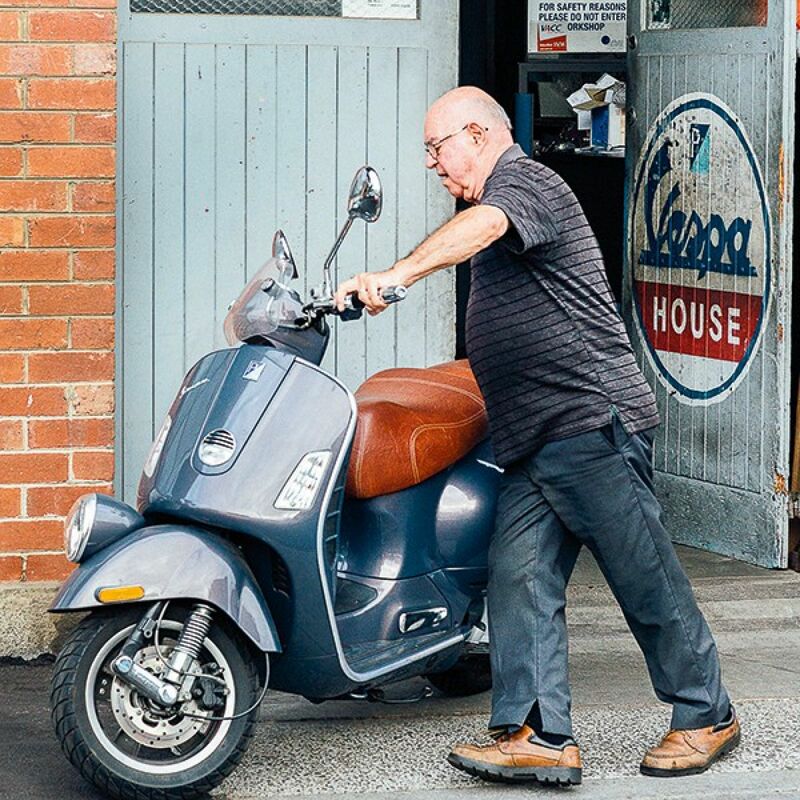 In 1956 Vittorio opened his Collingwood service and repair shop Vespa House and, nearly 70 years later, son Frank, now 76, grandson Dean, 41, and 20-year-old apprentice Anthony Barbizzi are still working in the very same building. 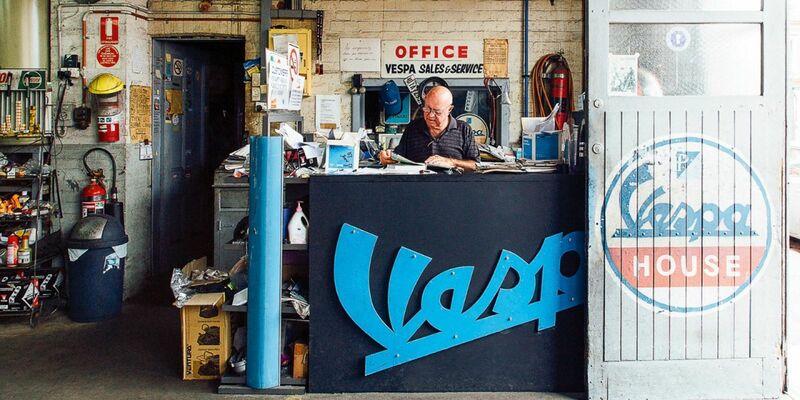 Frank Tonon’s Vespa House, in Collingwood, has been servicing scooters since 1956. In Gippsland, Jo Wilson, 52, has been riding Ruby, her dark-red 2007 GTS 250ie Vespa, for a year now. The Newborough nurse met her now-husband Noel online three years ago and his love of motorcycles – Jo had been on a motorbike only once before meeting him – has clearly rubbed off. The couple now both ride scooters (for their honeymoon they slipped on helmets and scootered through the Tarra-Bulga National Park) and Jo organises regular trips for the Vespa Club of Melbourne’s Gippsland branch, a growing group of about two dozen members, spread from Cranbourne to Bairnsdale. Back under the grungy bridge in Collingwood, the scooter breakfast is starting to wind down. Vespa Club of Melbourne’s youngest member, Charlie Meehan, 11, is about to saddle up for the ride home to Port Melbourne as a passenger on ‘Veronica’, a GTS 300 steered by his mum, Chantal. Charlie says he likes how riding a scooter is “open” compared to a car and he has a simple but impressive plan for the future. “Yeah. I want to live in New York and ride a Vespa,” he says.